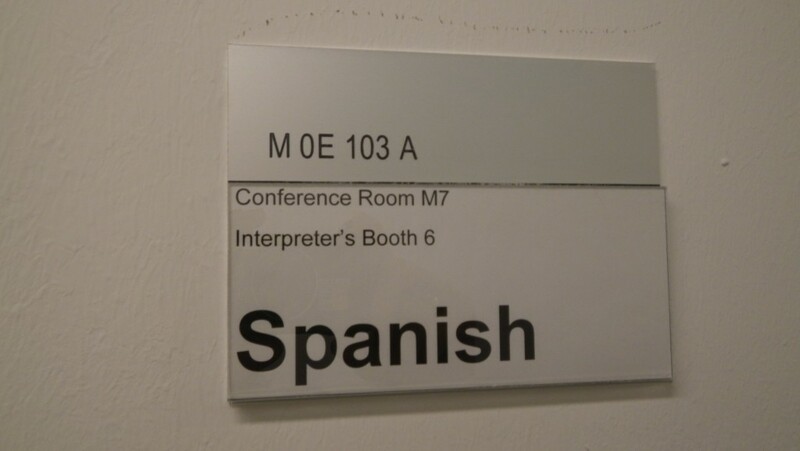 Door sign at a Spanish interpreting booth at the United Nations in Vienna. Translating and interpreting are highly complex cognitive activities that nobody is born but require hard work instead. The minimum requirement to become a successful translator or interpreter are excellent language skills in several languages. 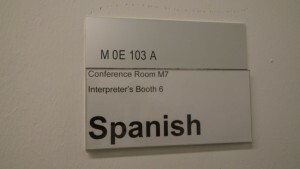 In addition, a truly professional interpreter and translator needs to have top-notch public speaking skills and/or a unique way with words, comprehensive general knowledge, resilience regarding stressful situations – and, in the case of interpreting, the ability to think on your feet and to make language-related decisions in split seconds. I am a seasoned translator and interpreter who masters all these skills. As a matter of course, I believe in uncompromising reliability, punctuality and professionalism. My academic background includes a degree in translating/interpreting as well as conference interpreting from the University of Vienna, where I have gone full circle to become a lecturer (Spanish-German interpreting). Also, I strive to build and expand my expertise on a continuous basis by attending CPD events, both in person and online. To round things off, I rely on a voice coach to work on my voice, in an effort of being a truly pleasant voice in your ear during interpreting assignments.